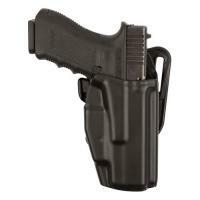 The Safariland Model 5377 holster is built for easy concealability, security and access. Safariland's trademark GLS™ (Grip Lock System) automatically secures the weapon when holstered without compromising your draw. When drawing with a proper shooting grip, the middle finger will activate the GLS™ lever, releasing the weapon for immediate use. The low-sided design makes drawing and reholstering even easier, allowing for extremely quick target engagement. SafariLaminate material used for the outer shell is both lightweight and durable, while the soft SafariSuede™ lining wipes away dirt and oil, protecting your firearm's finish. The backing includes a versatile three-hole pattern for compatibility with all Safariland mounting options. I just received this holster. I really works great. Conceals well. Easy to re-holster. I like the way most of Safariland holsters have the protective lining. Take a little effort to loop belt through but not too bad. Perfect for my needs. This holster is great for my propose. Conceals well. I like the way most of Safariland holsters have the protective lining. Easy to re-holster. I just received this holster but I'm sure its going do the job. Thanks CopsPlus. Very nice holster. Easy to draw from yet very secure. This retention holster is one of the few that will not damage you pistols finish. Hope they make this holster for older pistols as well.